Curtains Etc. 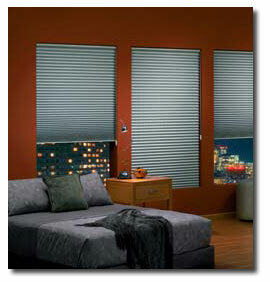 is proud to be a distributor of Graber Pleated Shades. These elegant pleated shades are available in sheer, semi-private fabrics in beautiful colors and patterns. Liner is available for added privacy and light control. EvenPleat® patented design keeps every pleat crisp and uniformly spaced from top to bottom  the fabric will not sag or stretch over time, ensuring more consistent color and light control. Semi-Opaque Shade Fabrics provide minimal privacy while delivering dramatic incoming light. Opaque Shade Fabrics provide more privacy than semi-opaque with even less definition of images through shades. Blackout Shade Fabrics provide maximum privacy and light control without any images visible through closed shades. Increased Privacy with a choice between privacy a liner or blackout liner. Privacy liner increases privacy while blackout liner creates total privacy. Both have a neutral streetside appearance and are available on select fabrics. Decorative overlay creates a unique look by overlaying sheer fabric on another fabric on all or part of the shade. Standard Cord Lift System features cordlock to hold cord securely in place at any position to provide dependable operation. Color-coordinated. Sun Up/Sun Down - Combine fabrics in different styles, colors and privacy levels for two shades in one. Provides a movable center rail that separates the two and can be positioned at any height with one or both shades showing. SkyTrack Skylight This feature is ideal for skylights, protecting furnishings from damaging sunlight and reducing heat gain and loss, and it is easily operated with a handle mounted to a moving rail, or with an optional telescoping pole. May also be used on regular window applications, eliminating all light gaps on the sides of the shades. Cordless Lift System for blinds/shades are a safe solution, ideal for homes with children or pets. Elimination of lift cord provides a clean, attractive appearance. Bottom Up/Top Down Corded allows you to lower your shades from the top or raise them from the bottom in order to maintain privacy or screen an unwanted view while allowing natural light to come in. Bottom Up/Top Down Cord Multiple Shades/Blinds on One Headrail offer two or three independently operable shades/blinds can be installed on a single headrail to provide a cleaner appearance. Ideal for large windows or patio doors.